Anyone who really knows us will tell they knew this was not a joke. It was Day Three of my return home from a weeklong trip visiting family in Kansas and attending a writers’ workshop in Ohio. Before I left on my Saturday morning flight Spouse had already begun preparations for replacing the floor in our bathroom. To the surprise of nobody, the project that was supposed to take just a few days managed to morph into a major hassle and there wasn’t enough time to complete it before my return. That Sunday, after dealing with a cancelled flight, rerouting to Boston and taking a bus back to Portland while my luggage found its way onto another Portland bound plane, let’s just say that coming home to the sight of a white porcelain bowl jutting out from our tub had me on the edge of using some potty language of my own. Ever wonder how a simple floor replacement becomes a full renovation? It’s easier than you would think. 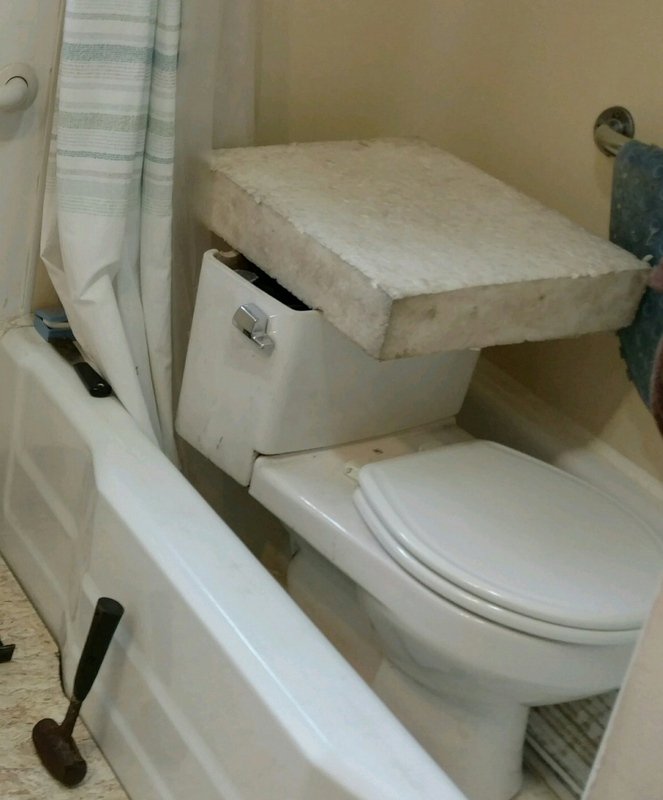 It started with a pipe that had to be replaced under the toilet, followed by rotted subflooring, which meant another replacement. From there we began talking about just how bad our cruddy old vanity and medicine cabinet would look with a new floor. The next thing I knew, Spouse was using the “s” word every other sentence. That’s right, folks. Sheetrock. When I refer to our bathroom, I am referring to our one bathroom in the whole house. We managed to deal with one bathroom as a family of four, but no bathroom is a little ridiculous, even when it’s down to just the two of us. If it hadn’t been for the fact that we have access to our wintering neighbors’ home, the next step would have been a port-a-potty in the yard – always a lovely addition to the landscaping. Sleeping across the street and running back home in the morning to have breakfast, feed the cats and gather our belongings for work was less adventurous than it sounds – and really, what part of that even sounds adventurous? Things came to a head Tuesday evening when I hit my point after not sleeping in my own bed for nine nights. At that point Spouse and I were ready to throw each other off the island, but I couldn’t carry through with that threat. I still needed him to finish putting the bathroom together. By Tuesday the toilet was back in place and usable, prompting my social media announcement. We are still in the throes of our renovation. Our new vanity sits in the garage awaiting its place against the new sheetrock… which is also in the garage. In the meantime, washing hands in the tub and brushing teeth in the kitchen sink (thank goodness it's a double sink) have become the norm. It could be worse. We could have a port-a-potty in our backyard.